I love sugar cookies. Old-fashioned sugar cookies. Drop sugar cookies (with lemon!). 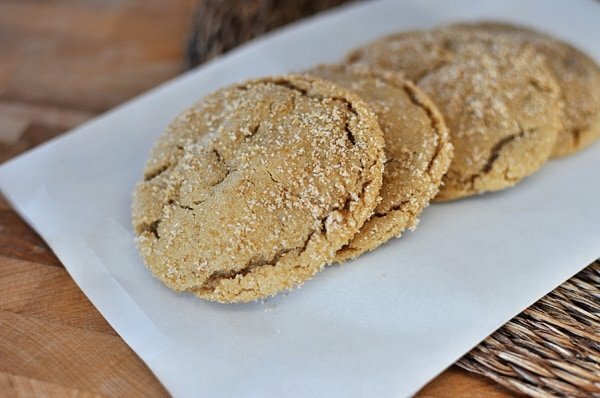 And any other type of sugar cookies, so why not brown sugar-sugar cookies? Not only are the flavor of these cookies deepened by dark brown sugar but the entire cookie base gets a delicious start from browned butter. And if you need further evidence that browned butter is the secret to all magical desserts look no further than here and here. 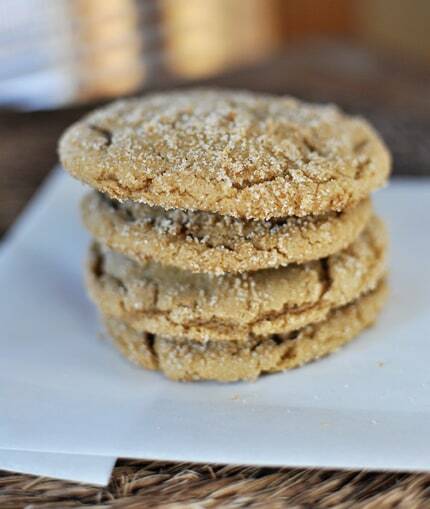 Quite simple in concept, the cookies are unadorned with any specific add-ins, which allows the browned butter and brown sugar flavors to really shine through. Just a wonderfully delicious cookie and you can’t ask for much more than that, in my opinion. P.S. In case you haven’t heard, I had my fifth precious baby a couple of days ago (pictures and details on facebook) which means I will be far, far from my computer for the next little while as me and all my boys snuggle and love on this new baby girl. Please be patient as I get back into the swing of things – I may not be answering emails and comments as quickly over the next couple of weeks. In the meantime, enjoy the posts I pre-scheduled to appear for your recipe-loving pleasure. Thanks for your support! Heat 10 tablespoons butter in a 10-inch stainless steel (not nonstick) skillet or small uncoated saucepan over medium heat until melted, about 2 minutes. Continue to cook, swirling pan constantly until butter is dark golden brown and has nutty aroma, 1 to 3 minutes. Browned butter can burn easily and quickly so keep a close eye on it! Remove the skillet or pot from the heat and transfer the browned butter to a large heatproof bowl. Stir the remaining 4 tablespoons butter into the hot butter to melt; set aside for 15 minutes. Meanwhile, adjust an oven rack to the middle position and heat the oven to 350 degrees F. Line 2 large (18 by 12-inch) baking sheets with parchment paper, silpat liners or lightly coat them with cooking spray. In a shallow baking dish or pie plate, mix the granulated sugar and 1/4 cup packed brown sugar, rubbing between your fingers, until well combined; set aside. Whisk flour, baking soda, and baking powder together in a medium bowl; set aside. Add remaining 1 3/4 cups brown sugar and salt to the bowl with the cooled butter and mix until no sugar lumps remain, about 30 seconds. Scrape down the sides of the bowl with a rubber spatula; add the egg, yolk, and vanilla and mix until fully incorporated, about 30 seconds. Scrape down the bowl. Add the flour mixture and mix until just combined, about 1 minute. Give the dough a final stir with a rubber spatula to ensure that no flour pockets remain and the ingredients are evenly distributed. Bake one sheet at a time until cookies are browned and still puffy and edges have begun to set but the centers are still soft (cookies will look raw between cracks and seem underdone - don't overbake), 11-13 minutes. Cool the cookies for 1-2 minutes on the baking sheets and then remove to a wire rack to cool completely. If you plan to use unsalted butter, increase the salt in the recipe to 1/2 teaspoon. 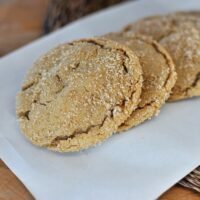 I wouldn't recommend substituting light brown sugar - because the brown sugar makes up the majority of flavor in the cookies, the dark brown sugar adds depth and substance. Next Post » Baby, Baby! These were delicious!! So good. Such good flavor. My two year old liked rolling the cookies in the sugar. I’m scared to be at home alone with these today. 🙂 Thanks for yet another wonderful and easy recipe! I am absolutely brand new to baking and these were the first cookies I’ve ever made from scratch!! The directions were super clear (thank you for that!) and the recipe seemed fairly easy. They were absolutely delicious, and everyone loved them! Thanks Mel! I’ll be trying the chocolate chip and triple chip pumpkin cookies next!!!!! Ohhhhhhhh. These are good. I am trying to resist eating another one right now. I made these the other day and they are incredible!! I think they are my new favorite cookie!! Oh! I forgot to say that I only had light brown sugar, but Alton Brown says to add 1 TBSP molasses to every cup of light brown sugar to make dark brown. Easy peasy, so I did it. Umm…these are great. They just came out and I maybe just sneaked one that is still hot. We are new to browned butter but I can see why it’s such a fun thing…fun, as in addictive and pounds-to-my-body-adding. These are wow. These are so, so delish!! I can’t get myself to share but a few with my kids so they don’t eat them all! I eat them for breakfast! I’m in love! Next time, I’m doubling the recipe and not sharing. These are truly fabulous and are probably one of my top 3 favorite cookies behind orange cranberry cuties and crinkle tops. I can resist many desserts, especially fancier or chocolate desserts (weird, I know), but not cookies. I’ll have to try these soon! I just tasted my first cookie and it was delish. I normally do not like a soft cookie but this was good. I did get more from the recipe because I use a smaller scoop. These will definitely be added into my Christmas cookie list to make. I made these this afternoon and these cookies are TO. DIE. FOR. Deliciously chewy! I’ve decided I’m just going to work my way down your list of desserts because everything I’ve made so far is delicious. Thank for you sharing! These are so delicious. I shared some with my mother and she swore it’s a recipe she’s been looking for her entire life. There was a shop in the town she grew up in that sold cookies like this. They were her favorite when she was a little girl and she always wanted to get her hands on the recipe. You made her day!! Delicious cookie! I got many compliments from my guests! Oh my goodness, these are delicious! I’m such a browned butter fan that it’s amazing that these even got baked. The buttery goodness comes through in the finished, baked product and they are heavenly – just like your new baby girl. Ava – I haven’t used those substitutions in this recipe so I can’t tell you exactly how they would fare but it’s always worth a try. I would skip the browning step, though…I don’t think margarine browns the same as butter but I could be wrong. Might be worth googling or looking into further. Good luck! Made these cookies today. Mine didn’t crackle and it was kind of hard to tell if they were done cooking because the dough is brown in color. Luckily I took them out at the perfect time (12 min). They taste good, not too sweet. At first I thought they were missing something-like chocolate, but then I found myself strangely addicted to them. I’ve been making this exact same recipe for years, people absolutely love them! i just love desserts that focus on brown sugar. terrific cookies! Congratulations to you and your whole family. Every baby is wonderful but so nice to have a girl. You learn how fast they grow, enjoy the newborn weeks, and try to get some sleep! Question: for those with dairy allergies – do you think margarine or non-dairy substitute would ruin it? Also, does the browning rule apply? Congrats on your new little one! And OMG, these cookies are SO good. I made a batch this morning, and by dinner time we’d eaten about half of them…and there’s just the two of us! If I can manage to hang on to a few, I’ll crunch them up and put them on home made vanilla ice cream…if I can keep a few from getting eaten! Congratulations on the baby girl! That is so exciting after boys to finally have a girl. They are both so much fun though! I made these cookies tonight! AMAZING! My kids were declaring them their new favorite cookie!! Thanks for the great recipe! Congrats on your new baby girl. How wonderful for your family! Congrats on the new baby!! These cookies look great…thanks for sharing! Congratulations on the arrival of your new baby girl! Have fun! Congratulations! Enjoy your little baby as much as you can! I’ll have to go check for pictures! Congratulations! Enjoy this special time with your family. Congratulations, enjoy your sweet new baby girl! Oh Mel, I am so excited for you and your family. Girls are so much fun. She is going to be so spoiled with all those protective brothers! What a blessing. She will have a hard time though watching her girly figure with all of your wonderful cooking:) What a cute name Camryn. These look great!! Thanks for all you do for us and try to get some rest. Congratulations on your new baby girl! We’re the opposite over here–a girl first, followed by a bunch of crazy boys. I can’t wait to make these cookies. My oldest son would eat brown sugar for breakfast (with just a sprinkling of oatmeal on top) if I let him, so he will be delighted about these cookies. Thanks, and enjoy that sweet little newborn:). Just pulled a double batch out of the oven. To. Die. For. My new favorite 🙂 Congratulations on sweet baby Camryn! What a precious blessing! Congrats Mel! I will have to wait for a picture to show up here since I am a dinosaur and therefore do not use Facebook. Enjoy your time with that precious baby girl, we all have a whole blog full of recipes we can try or try again. My husband doesn’t like regular sugar cookies, but he LOVES these! Just got them out of the oven and they are wonderful! And congrats on the new addition! Congratulations! Hooray for pink! And not being pregnant! I looooove these cookies. These are some of our favorite cookies from America’s Test Kitchen. I like them best warm, so I always make a huge double or triple batch and then freeze them in cookie balls after rolling them in sugar. In my oven they are perfect after 16min. at 350 from frozen. I have found it makes a big difference to make sure your brown sugar is fresh– they will be less crumbly. I think I need to go make a big batch of these now. In, er, honor of your good news . . . yeah, that sounds like reason enough. Congrats Mel!!! She is just precious! I have 2 boys and then 1 girl, and it has been fun having a little miss around 🙂 Enjoy that sweet stage….I can almost smell that newborn sweetness through my computer!!! haha! Oh, and these cookies are on my must try list! I heart cookies and brown sugar! Baby Camryn is beautiful! And such chubby cheeks! 🙂 Love them! Sending a BIG hug to her and her big brothers! (The littlest boy in your family is a big brother now! I’m sure he’s thrilled! Hang in there mommy! Congratulations on the baby! Can’t wait to look at pictures. And may I just tell you that I had the weirdest dream with you in it last night. I came to stay at your house, which looked like it was 100 years old and used by pioneer settlers. You had your parents and brothers living with you, and your husband and a few kids. These people all looked a little sketchy, to say the least. I also tipped over a huge crockpot of some bean/chili thing you were making so you had to do a huge post with everything x’ed out because you had no data on the meal. It was bad. You didn’t like having me there. I woke up sad…and then immediately relieved that you didn’t, in fact, live with a bunch of toothless yokels in a ramshackle hut. 🙂 Anyway, hope that made your morning. Congrats on your sweet baby girl! How fun! I’ve been checking in here every day for details of the baby! Just hopped over to FB – she is ADORABLE and perfect!! Enjoy!! Congratulations! How wonderful for you and your family. I’m going to facebook now for details and pictures. I’m happy for you! Congrats on your new addition – now I can’t wait to check FB. YAY!!!!! She is just perfect!! Congrats!!!! She is beautiful! What a blessing! Blessings and congratulations on the beautiful addition to your beautiful family! These look great! I think they’ll be on my weekend bake list. Congrats, Mel! Girls are so much fun. These cookies look wonderful. I love that they are a completely different twist on a nice classic cookie. I love this simple, and tasty looking cookie! Yum!